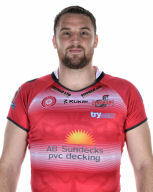 After leaving to join Wigan Warriors at the end of the 2013 season Sam was soon back at the LSV in 2014 and played 20 games on loan, impressing in Leigh’s dominant pack.The Centurions then extended that loan period to cover the whole of the 2015 season before agreeing terms for a permanent move with the Warriors midway through the year. After emerging through the ranks at Leigh East, Sam made rapid strides following his senior debut in 2011 and followed the lead of team-mate Chris Hill in signing for a Super League club. He passed the landmark of 100 Leigh appearances late in the 2015 campaign. He played one game for Workington Town on dual registration from Wigan in 2014.